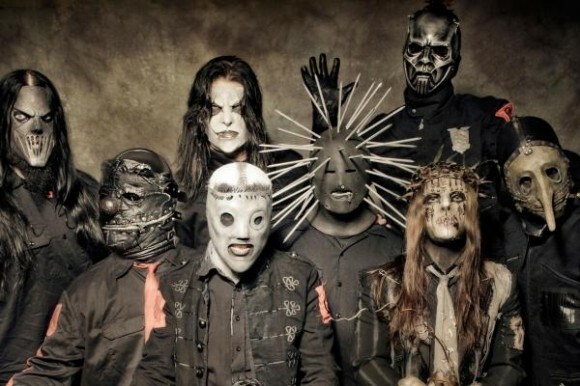 Despite rumors circulating around the band’s new lineup, Slipknot’s song off their latest album is as heavy as ever. It also reveals who might have taken over for bassist Donnie Steele. As Slipknot’s new album .5: The Gray Chapter approaches its October 21, 2014 release date, the band’s busy churning out a new video for one of the tracks. “The Devil In I” music video features classic imagery that made this heavy metal band famous. A masked man bound by a straightjacket is pushed down the halls of a decrepit old building while other masked figures seep blood from their mouths and light themselves on fire. It’s like a mashup of deleted scenes from a horror film about a murderous circus troupe that visits a hospital for the criminally insane. Although the official lineup has not yet been confirmed by the band, bassist Donnie Steele and drummer Joey Jordison are reportedly no longer full-time members. As Blabbermouth points out, the video reveals telling tattoos on the new bassist’s hand. They match perfectly with Alessandro “Vman” Venturella, guitar tech for bands such as Mastodon and Coheed and Cambria. Venturella also played in Krokodil. Tattoos on his left hand feature a skull in the center of a spider’s web and the word “deth” inked on four of his fingers. Alessandro wears the same mask Steele wore, and singer Corey Taylor said the mask tradition will continue for both new members. At least fans can expect to watch what looks like the same lineup during the group’s fall tour. Their new drummer has not been confirmed, although fans of the band suspect he is Jay Weinberg. Weinberg isn’t new to the industry. His father Max Weinberg plays in Bruce Springsteen’s touring band. Slipknot’s album .5: The Gray Chapter will be the first studio release since original bassist Paul Gray died in 2010. Slipknot is on tour this fall. Check out the dates here.